I am a newbie and I posted for the first time a few weeks ago. I am looking to purchase a Bird of Paradise Rol a Top. I know this particular machine commands a high price and within reason I am prepared for that. What I am after is a European Rol that is fully loaded. So skill stop, gold award, mint vendor....... I live in the UK and can also collect from Europe. It does not have to be fully restored but should be in working condition. My knowledge was almost zero. A well known member of this group Stephane has given me some fantastic information. He has been so helpful and at least I know some of the things that I should be looking for. He is a very good guy. So if anyone has a bird for sale in the UK / Europe or knows of one for sale then please send me a PM. I have such a machine but I live in the states. 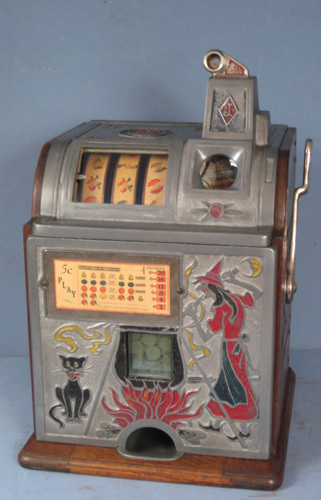 This is a quarter machine with golden award award, skill stops and mint vendor. The machine is unrestored. Thank you for replying. A lot has happened since I posted my email 15 months ago. I have purchased my first two slot machines. Both are “Bird of Paradise Rol-A-Tops”. The first came from France and the second from Italy. Both are now complete. Great thanks must go to my now good friend Stephane and also Watling Boy, Larry Deburgh, Dave Berten & Larry Griffin. Thanks guys for all your help. I have attached photos of my two RAT’s. Also picked up an original Watling mould. My guess is that it was some type of stamp? I have attached a photo. I would love to know what it was used for so any idea’s as to what it is are most welcome. My next project will to be to find a cherry top ROL. I am not sure that these were imported to Europe as I have not seen a single one in the UK. The forum has been a revelation for me. I could not have progressed without it so thank you Dave. you're talking about "Stéphane". Is it this French guy who's recognized in the small world of slot machines (in France) and known to be the specialist of the TURA ? Machine very popular in France and especially in Germany !! This guy is amazing !! So that there is no confusion I am indeed referring to Stephane Guillet, who is i believe recognised around the world as a Watling expert and is a very good guy. . I travelled across the U.S.A. this year on a Watling road trip. California, Nevada, Illinois, all the collectors that I met knew Stephane Guillet. You Mills also deserve applause for your website which you co-host. I recommend to any slot collector that they look at this website which has great images. No translation needed, the images speak for themselves.